These elegant wood frames have a flat profile for photo sizes from 4x6 to 16x20. Includes glass and backing and comes ready for wall mounting. A solid wood picture frame with a flat profile for 4x6 photos or images. Includes glass and backing. Comes ready for wall mounting and includes easel. A solid wood picture frame with a flat profile for 8x10 photos or images. Includes glass and backing. Comes ready for wall mounting and includes easel. A solid wood picture frame with a flat profile for 11x14 photos or images. Includes glass and backing. Comes ready for wall mounting. A solid wood picture frame with a flat profile for 16x20 photos or images. Includes glass and backing. Comes ready for wall mounting. These elegant wood frames have a flat profile for photo sizes from 4x6 to 16x20. Includes glass and backing and comes ready for wall mounting. 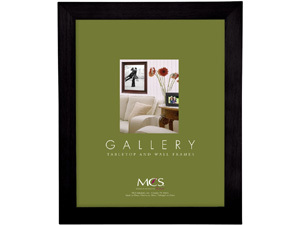 Mix and match frame sizes and styles to create a unique gallery wall.